Old School Rocker doesn't have a personal statement currently. Any kinda old school music ex. 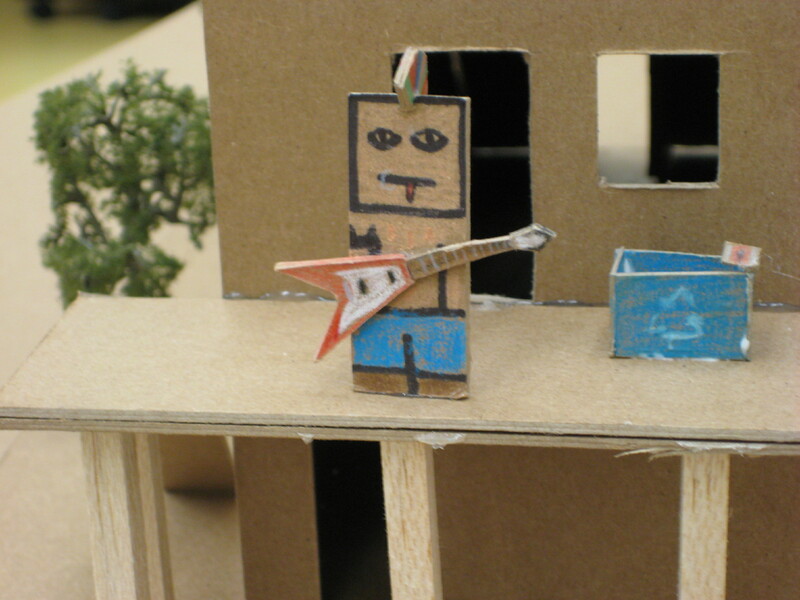 Well to start its called the ACDC house, and one of the guidelines of the project was to build a "Sustainable" house which is like a green house basically it has to be an environmentally friendly house so you will see some of the features in the pictures I show you. 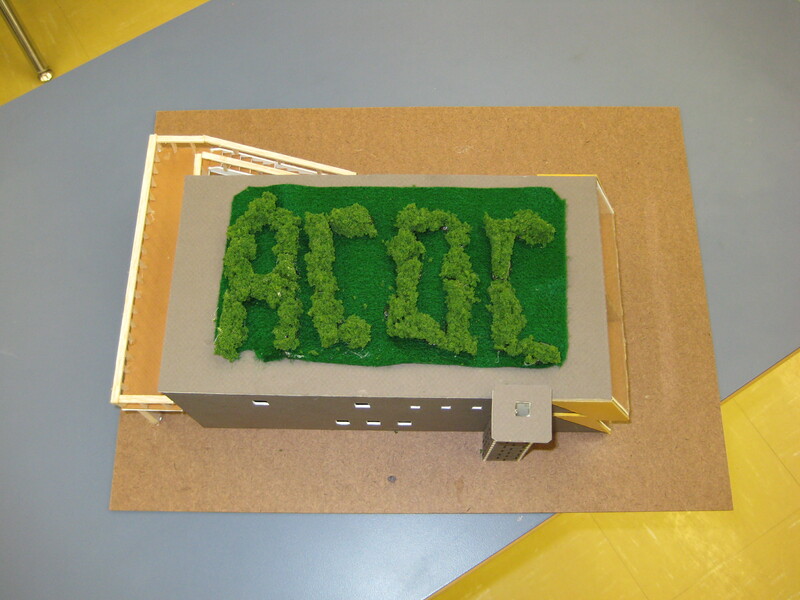 Well this picture shows the model's "Green roof" which has been "Gardened" by myself to spell ACDC. 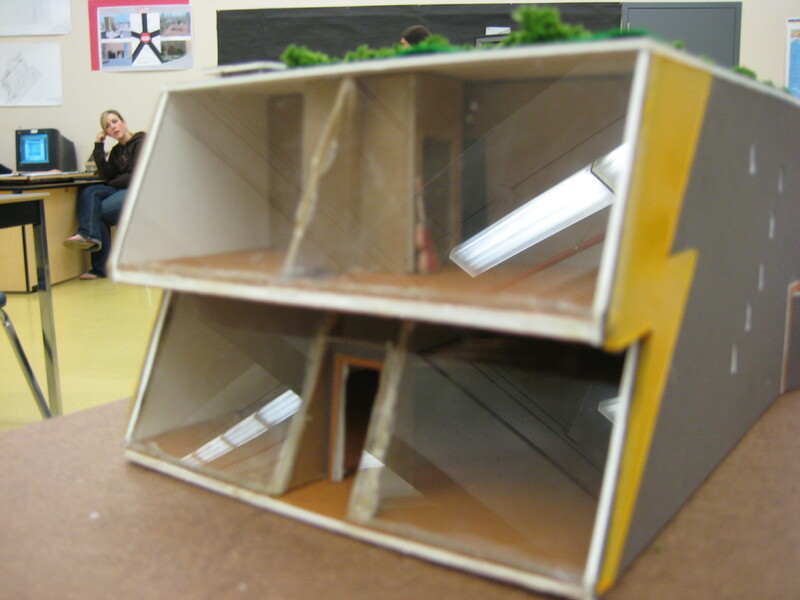 This Picture shows the buildings South side facia with the lightning bolts on the front sides of the house. 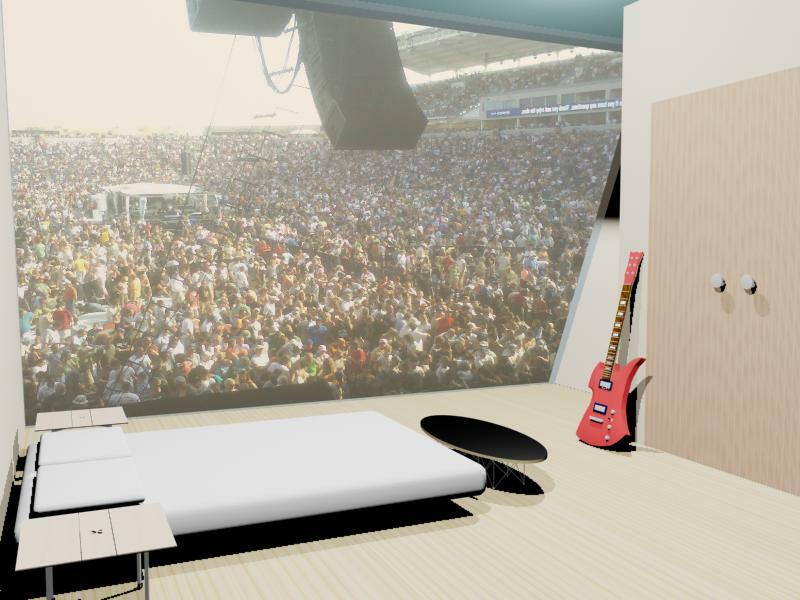 The picture also shows the models south side glass which alows for maximum daylight to enter the building for warmth and comfort, therefore less elctric heat is needed. Hope you guys like it, Im' very proud of the work that I put into it as well as my partner. Hey Gaberiel I've been practicing your Stoner Rock lesson for a little while its coming along quite well but I've been having porblems with the part where you mute the power chords, I just cant seem to get a real heavy tone like you have on the video. Im not sure if its whether or not im muting too much, or if its my gear, or my volume, or what but if you have tips on how I can get my muted power chords to sound good and heavy id appreciate your help. Oh yeah one more little question. I can seem to get my guitar to sound the way I want it in tearms of tone and I know you use a PODX3 I think... but my question to you is would you recomend one to me if im a beginner who wants to keep playing till I die, and will it help me get the sound I've been wanting outta my guitar? I dont know if the guitar I have affects the tone but I play a BC Rich Mockingbird Masterpiece. The the tone im really trying to achieve is a killer Classic Rock tone like Joe Perry, Jimmy Paige, Slash (when he was in GNR) and Eddie Van Halen. They are my Favorite Guitar players so It'd be a dream to sound like them. Ok forgive my beginner-ness (I cant figure out a better word right now but anyway ) I was using Audacity and I was wondering, I've heard when using Audacity you can remove vocals and other parts of a song. So right now im just playing the 2nd Solo for the song "Angel" By Aerosmith over and over and over and over again and now I would like to remove vocals (if you can even do that ) So if anyone has any knowledge of this I would appreciate it if you could help me out. Ladies (or Anyone) Of Gmc Could Ya Help Me Out? I ask for the Ladies in particular cause its about my Sister and i figure you may understand better but im not sure....I was also gonna post this in the ladies section but Guys arent supposed to start threads so this'l have to do. Well im gonna give an example to help people answer this question. My sister is 17 and now a very dark scary kinda girl not all freaky looking... just dark, she has the whole lip, eyebrow, ear pericing thing going on and she has black hair with red in it and pretty much wears only dark clothing and dark make-up, and anything dark looking she wants it. Now about 2 years ago she was a pretty, bright, & happy girl who listened to normal music IMO (I'l get to the music part in a second) but now this i've noticed she listens to music like: Disturbed, Kalmah, Slipknot (those are the three I noticed the most) and any other band that screams isanely and seems to be hatefull or has the word Die or Death in at least one of there songs, basically its dark death metal stuff. Yes i know there are some good metal bands, I dont like many but, back to the point. Now that my Sis has been Listening to all this her attitude has gone from nice happy person to angry mean girl who you probably whould'nt talk to. Its even started to affect the familly now every weekend I come home from colledge and there is a huge fight about something and it ends up being about her uncontrollable anger and I believe that it is because of this terrible, angry, dark music. Now as for our familly life its great so I dont think thats the cause as for her social life its been relitvely good as well never the most popular but she never cared about all that she had the one good friend and that was plenty. So what im trying to get at is I think that her anger and darkness is because of this music. I know this is probably hard to answer but if you know somebody like this or you are like my sis any kind of feedback would help. As well as Id like everyone's oppinion whether or not you think music styles can change someones personallity. yes...but I'm a Sens fan so right now I feel your pain :) I love the west coast though. BC is great. So beautiful. Been there a few times. I'm in NL. originally from NS.